Makes a great unique gift, especially when coordinated with other office & desk accessories. 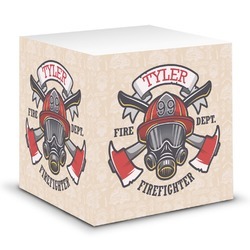 If you are a sticky note user, you will love our personalized sticky note cubes. These note cubes are not only beautiful, they are practical, look great on your desk and put a smile on face every time you use them. They make great gifts because every one loves personalized gifts and everyone uses sticky notes. Don't forget to get one for yourself as well! 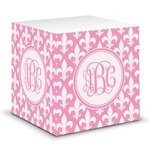 Our note cubes are available in hundreds of different prints, patterns and colors. You can easily customize your cube in our customization tool. You can change the layout, the background, the colors, the label and ribbon and of course the personalization. We have many personalization styles e.g. Initial, name, monogram and 100s of fonts for you to choose from. You design will be printed an all four sides of your sticky note cube. Each cube has 700 sheets of paper; each sheet has an adhesive strip and measures 3 1/2" x 3 1/2" square.